What's more American than mom and apple pie? Or, as Bob Dylan asked in Jeep's Super Bowl spot, "What's more American than America?" One possible answer is the National Football League. Professional pigskin may be the United States' most popular sport by a mile (or at least 100 yards), but it has never made a paid appearance in the Olympic Games … until now. The NFL debuted its first Olympics ad in the opening days of this year's games with "One Team," created by Grey New York. 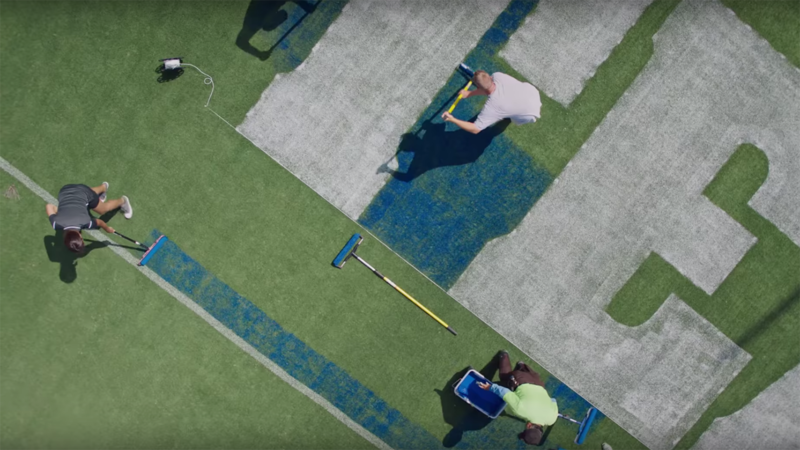 The work was developed in collaboration with the NFL, the U.S. Olympic Committee and some dedicated groundskeepers. The campaign reinforces the workmanlike appeal of the NFL while simultaneously casting its 32 teams as proxy representatives for the entire country during a summer when Americans from coast to coast have united to watch our athletes compete in Rio. As the tagline reads, "Football Is Family," no matter how big that family might be. This ad's real star may be St. Vincent's reimagining of the Star Spangled Banner, which updates Jimi Hendrix's classic 1969 Woodstock rendition with the help of some overdubs and at least one active whammy bar. "One Team," which debuted on Saturday, will run in 30- and 15-second versions across NBC's properties (Bravo, CNBC, The Golf Channel, USA) until the games end on Aug. 21.